Several hundred proof (or pattern) Flying Eagle cents were made in 1856, and delivered to congress for approval on the proposed size reduction of the denomination. 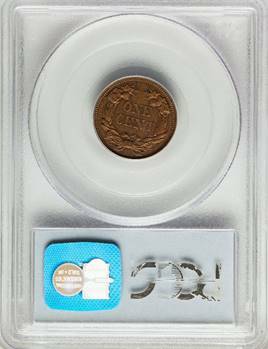 When collectors became aware of these pieces, demand grew rapidly, and so the Mint struck more of the 1856-dated cents in the following few years for direct sale to collectors, with a final production total estimated between 1,500 and 2,500 coins. 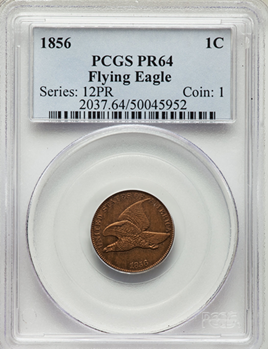 Debate continues on whether or not the entire mintage was of proofs, or if the restrikes were from regular production dies, but whatever the case, any Flying Eagle cent bearing the date 1856 remains highly sought-after. Listed at $20,300 in the CDN CPG, $20,500 in the PCGS price guide and $20,000 in Trends. We do business the old fashioned way, we speak with you. Price is based on payment via ACH, Bank Wire Transfer or Personal Check.